There are a number of professions out there – accountants, lawyers, doctors, and more – that all have professional societies that limit their abilities to engage in some business practices in exchange for the professional designation. The purpose of this has long been to ensure that the profession maintains a specific level of expertise for clients. From an economic perspective, it has also been a way to ensure that the information asymmetry is limited and that the professions don’t take too much advantage of the average person. This is similar to the stereotypical complaints that go on about lawyers and mechanics taking advantage of clients that don’t understand. Whether it is the lawyers that start dropping legalese in your friend’s bad stories, or that time that you felt kind of messed with at a mechanic without being able to tell why, professional societies arguably exist to prevent this type of thing from happening. There are much better and more in depth versions of these discussions and, while they are important, are better held elsewhere. Professional societies are important, for the purposes of this article, because they often put rules and limitations as to how different professions can advertise. Lawyers, for example, are limited in the ways that they can market their law firms and their services. As the profession has continued to grow and develop, including coming under increasing pressures to be economically competitive. With these increasing pressures to become more competitive, professional societies have spent the last few decades slowly opening up to increased marketing, both in the letter of the rules and in the larger cultures of these professional societies. They are marketing more and more, whether it is picking up bus advertisements, billboards, or even professional vehicle wraps. These changes mean that more and more professionals are going to need to start to market themselves, and market themselves well. 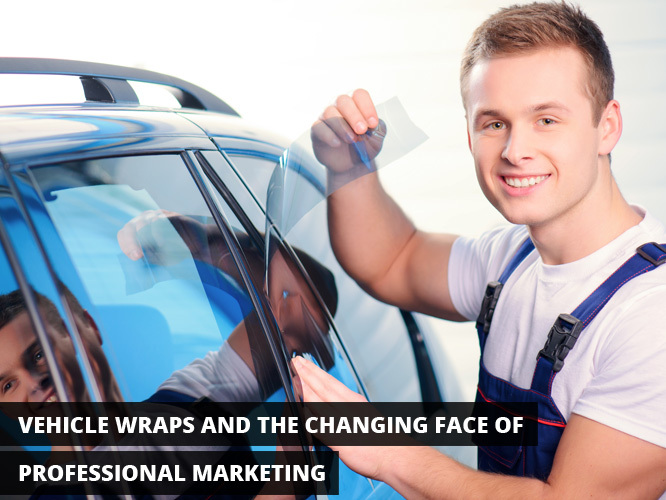 Vehicle wraps present what is both an effective, and manageable step for many professionals to start their move into marketing. They can be easily attached to nearly any vehicle, whether it is one that is used solely for work or one that is both for work and pleasure, and they easily serve as a moving billboard for their professional brand. Above and beyond this, vehicle wraps provide a number of benefits that a sign franchisee would do well to convey to a potential customer. A vehicle wrap is a strong first step towards establishing a brand. One of the key aspects of introducing vehicle signage is how effectively it can make it seem like the company in question is present around the city. Signs in a single location are easy for an individual to see and make judgments on. A vehicle, however, is capable of moving around the city, and even a single one, viewed in different locations, can give the subconscious impression to the viewer that there is a larger footprint to the company than may be otherwise available. This growing trend in professional businesses, combined with their new marketing needs, show how complicated that these marketing challenges can be, and provides a new market for sign franchises to serve. As more and more people flock to various professions, much less starting their own new businesses, they are going to need to be able to market to stand out. These are going to need to be in a variety of different methodologies and media. Either way, this is a growing and interesting market that sign franchises are going to be interested in keeping an eye on, and continuing to develop.